In the midst of this Annus Horribilis, Pope Francis has called his people to devote themselves to praying to Mary and to Saint Michael Archangel to ask for their protection. Heinvited “all the faithful, of all the world, to pray the Holy Rosary every day, during the entire Marian month of October, and thus to join in communion and in penitence, as the people of God, in asking the Holy Mother of God and Saint Michael Archangel to protect the Church from the devil, who always seeks to separate us from God and from each other.” The Pope asked the faithful to conclude the Rosary with the ancient invocation Sub tuum praesidium (“We fly to thy patronage”) and with prayer to St. Michael the Archangel. The prayer contains references to attributes and prerogratives that in the Bible are clearly and exclusively relegated to God, e.g. His protection, His acceptance of our petitions, His ability to deliver, and Him being glorious and blessed. And yet, this Marian prayer ascribes all of these functions to Mary and, in so doing, deviates the focus from the Triune God to Mary. There is no doubt that Rome is going through difficult times. The institution that appeared strong and stable is now showing signs of seriousweakness at various levels.The suggested diagnosis of the current crisis, i.e. the “black sheep” explanation and the evil of clericalism, seems to be self-protective and unwilling to engage the real issues at stake. The proposed cure to the problem, i.e. the invocation of Mary and the saints, is even more problematic. 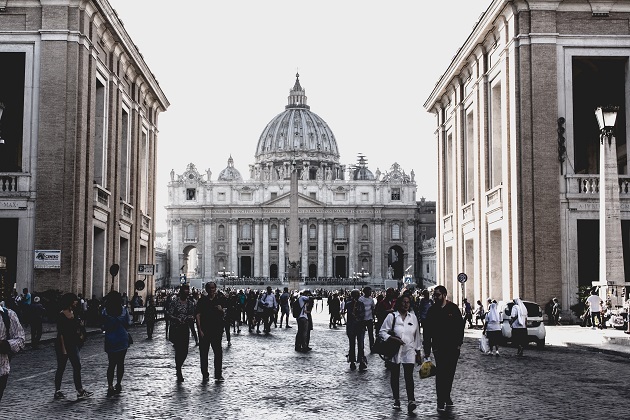 Both the diagnosis and the cure do not show any indication that radical biblical renewal is taking place in the Roman Catholic Church as a whole. The gospel is still obscured by centuries of unwillingness to expose the church to a time of doctrinal reformation and by scores of devotional practices that lead the faithful astray. As Christians we grasp the power of intercessory prayer, for "the effectual fervent prayer of a righteous man availeth much." It's effectual only because we pray in Christ, in the Body. We encourage all members of the Body to do their part. Can't say "I don't need you!" Those in heaven have their part, too. In any case, if I ask a fellow servant for help,or I ask you, dear Leonardo, I am not worshiping you, I promise you that! :o) I do not worship men or angels. But I do ally with them.